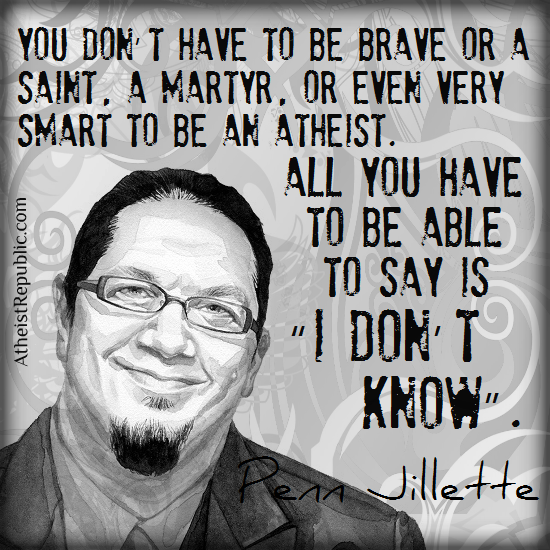 "You don’t have to be brave or a saint, a martyr, or even very smart to be an atheist. All you have to be able to say is “I Don’t Know”." Hmm... I thought that qualified as agnosticism, not atheism? There's been discussion on the forum as to exactly what the definition of each word is, if there's an overlap between the two... or if that even matters at all. Anyway, I love the spirit of this quote and I concur! Yeah me too! To both points! For some saying I don't know takes a tremendous amount of courage though it shouldn't! LOL i love the simplicity of this one but its so true also. There are many things that complicate the whole idea of atheism, but at the end it's just to acknowledge that you dont know. When I spoke at a Religious Understanding gig in my community as the Atheist/Humanist representative I was on a panel discussion. Someone from the audience asked 'What happens after death?' and all the other speakers were able to give a descriptive response, I was the only one to say, "I don't know." The idea of being able to say "I don't know" is something that is very difficult in today's society. We are either afraid of being labeled as stupid and becoming less of a person or we are so set in our old ways that we don't want to know about something whether it is new or old. I once read something saying that the wiser one gets, the more one realizes what s/he doesn't know, or something to that effect. This quote makes so much sense. If more of us could say I don't know every once in a while, we might all learn something. I don't know a lot of things, none of us do and I think the fact that we ask questions, makes us dangerous to the religious elite in our world.